In this study, produced to accompany a display and short talk contributed to a seminar on ‘Moated Sites & Churches in the Landscape’ organised by Surrey Archaeological Society’s Medieval Studies Forum in March 2015, Peter examines the evidence for nine local sites where the present or former existence of a medieval moat has been suggested. times of the 13th and early 14th centuries. establishments, especially those remote from areas of settlement. others are only known from map and other documentary evidence. of Merton Priory. Site now covered by school buildings. site or whether it was part of a gardening extravaganza is not clear. evidence suggests that there was possibly once a moated site here. has now been filled in and built over. could be the remains of a moat. The site is that of a medieval manor. considerably altered when the present house was built in 1770.
cannot now trace the reference. Corroborative evidence is needed. within Merton Historical Society for many years, and knew the area well. Detail from a modern street map, showing the sites discussed in this book. all that capital messuage heretofore built and erected by Henry Pratt Esq. remaining lands being within Wimbledon parish, north of the road. pond and the moat that gave the site its name, is clearly shown. 1768 represents the moat surrounding the house. which keeps the whole place damp. had survived, and these were soon to disappear. visiting my relatives.’17 Here is a copy sketched by John Wallace. been leased to hyller in 1533.
recorded at the time of Nelson’s purchase of Merton Place. passed to his grandchildren, the eldest of whom was Ellis Crisp. site of the former moated dovehouse. Could this stone closet have utilised part of the original dovehouse? had occurred by 1737 to create the farm known as Blue House Farm. common sewer at West Barns in Merton, in the land of C. F. Bond Esq. western edge of the estate. pond, indicating that it already existed when the garden was established. ‘Church Meadow’ at almost 3 acres (see tithe map extract below). st Mary’s church, reproduced below. Survey 25-inch map of 1864.
manorial economy at that moment. henceforth are able to require from them another way. livestock, such as would be provided by a moat, was considered necessary. Ordnance Survey 25-inch maps, the channels enclosing about one acre. adjoining the site of the house, as suggested above for Merton Place? lord of the manor of Morden. Barnack of the fitzAnsculf honor of Dudley. Wicford estate had passed into the possession of William Mareys. appurtenances which I have in Wykeford in the parish of Mitcham. Mitcham Grove site, discussed in the next section. estate, though field name evidence has not survived. being the site of William Mareys’s capital messuage mentioned in 1361. 1361 had formed a moat. House, its surrounding estate having been redeveloped for housing. The Ordnance Survey map of 1867 seems to depict it as shrubbery. if such it is, be a remnant of this water feature? be added Merton Grange and Mitcham Hall. Merton priory, and might even have incorporated part of its structure. moat, the primary moat having enclosed the adjoining Merton Grange. into the 1930s, the house being called Moat Farm into the 19th century. family’s medieval home, survived into the 1920s. been improved for aesthetic purposes. likely, again probably associated with calico bleaching and printing. engulfed it, but its precise purpose and form remain unknown. the 1822 appearance of the artesian well. moat surrounding the medieval house. to important medieval monastic establishments and manorial centres. to separate it from its parent holding. lies on the heavy London Clay, and ditches were essential for drainage. None of the other sites in this study were on the clay. in the National Maritime Museum, Greenwich. Gilbert, founder of Merton Priory’ in Studia Monastica 12 (1970) pp.248–249. marriage of Gervase Paynell’s daughter, long after the time of Henry I. 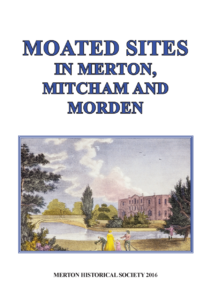 This entry was posted in Publications, Booklets, Publications and tagged in medieval Merton, medieval mitcham, medieval Morden, merton, mitcham, mitcham grove, mitcham hall, morden, morden hall, nelson, ravensbury, The Canons, west barnes.